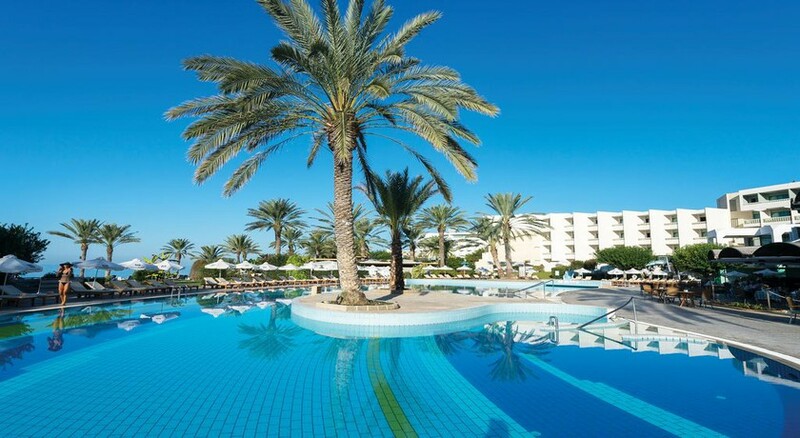 Constantinou Bros Athena Beach Hotel is a 4-star resort that exemplifies luxury and elegance. This sophisticated chain is renowned for its exceptional services, gourmet dining options and a friendly staff, and is blissfully located near the picturesque harbour of Kato Paphos - offering stunning views of the Mediterranean. There is plenty of entertainment in the surrounding area, with archeological sites, restaurants, shops and two superb golf courses within close proximity, plus available transport in front of the hotel. The spacious rooms ooze understated luxury, with comfortable furnishings and floor-to-ceiling windows that look out over tranquil gardens and swimming pools. Leisure facilities are aplenty, with a variety of swimming pools, floodlit tennis courts, mini golf, Bowls Greens, relaxing Elixir spa facilities, a kids' club and more. Valid from Summer 2018 is the hotel's new Elite Class Experience, whereby guests will receive additional 5-star amenities, including exclusive check-in, extra dining options and more. Situated at a distance of 15km from the Paphos International Airport, Constantinou Bros Athena Beach Hotel is within the walking distance of two golf courses and Paphos' idyllic harbour and port. If you can drag yourself away from the hotel's fantastic facilities, the neighbourhood is bustling with shops, restaurants and bars, all of which are within walking distance. Absorbing the warm tones of the Mediterranean, the rooms of the Constantinou Bros Athena Beach Hotel feature relaxing shades of blue, beige and rust. The hotel offers 327 beautifully appointed twin or double rooms, 76 superior rooms, 7 superior deluxe terrace rooms, 10 junior suites with private pools, and a variety of executive suites. All rooms and suites come equipped with air-conditioning and heating, LED TV, radio, fridge, mini bar, hair dryer, safety deposit box and tea and coffee making facilities. Breathtaking views of the ocean, gourmet food and fantastic services are just a few of the things that define the dining experience at Constantinou Bros Athena Beach Hotel. Enjoy an alfresco style dinner at the Palm Tree Restaurant or experience fine dining at the Zephyr a-la-carte Restaurant, which is also open for breakfast. Leda Italian restaurant offers Mediterranean breakfast buffet, while the robust flavours and spicy delights of the Far East come alive in the hotel's Atrium Restaurant. Lighter options are available at the poolside Adonis Restaurant for those post-swim snacks or sit back with a cocktail at Helios Beach Bar. Beach, pool, spa and sauna are some of highlights of the hotel’s luxury services. The newly upgraded Elixir Spa offers 800 square meters of pure indulgence. Massages, beauty packages and wellness therapies are some of facilities you can expect after a day of sightseeing, swimming and sun-soaking. Those who love lounging by the poolside, soaking the warm Mediterranean sun, or sipping their favourite cocktail will love the variety of swimming pools the hotel has to offer including freshwater, indoor and Jacuzzi. For little ones there is a kid’s club, where they can meet other children and enjoy daytime entertainment. For sports enthusiasts the floodlight tennis court, mini golf course and Bowls Green facilities are some of the options that one can try out. The perfect place to relax in the sun! I've lost count of the number of times we've been to Athena Beach and after each visit we can't wait for the next. Great service, welcoming staff and lovely food. We always opt for the premium all inclusive to enjoy the upgraded Superior rooms and A La Carte restaurants. It is a fair walk from the harbour but we like that as we just go for a quiet relaxing week in the sun and are in the process of booking again for this year.